Unfortunately for the company, they secured workers comp insurance through New York Compensation Managers (NYCM), the now defunct operator of a dozen self-insurance groups in New York. NYCM claimed to offer favorable rates, strict underwriting standards and exemplary claims services. They ended up with egg on their face with their inadequate rates, suspect underwriting and rampant under-reserving of claims. In retrospect, the operation ran around like a chicken with its head cut off. By the time the problems emerged (in 2006), it was too late to shake a feather and correct the problems. Following the SIG’s failure, Murray Bresky Associates was hit with a $1.2 million assessment to make up their share of the SIG’s deficit. That ain’t chicken feed. Murray Bresky is not chickening out of a fight. Indeed, the chickens have come home to roost in the form of a lawsuit filed against NYCM and its board of trustees. The lawsuit seeks to recover the $1.2 million and then some, alleging breach of contract and breach of fiduciary duty. The case worked its way up to the NY Supreme Court, Appellate Division, where the motion by the defendents to dismiss the lawsuit was, for the most part, dismissed. One of the former trustees of the SIG is squawking that he was not aware that he was, in fact, a trustee. He may have signed off on a few trustee documents, he may have performed some of the functions of a trustee, but he insists that he had no memory of being appointed. He insisted that he was not a bad egg and claimed that he had no place in the pecking order. The court, however, ruled otherwise. As the saying goes, you have to break eggs to make an omelette. Quite a few more eggs will be broken before this particular concoction is served up. Hard-boiled attorneys will parse the details to figure out who, if anyone, owes Murray Bresky Consultants and exactly how much they owe. The courts now rule the roost. They have upheld Murray Bresky’s right to sue, with the exception of some actions that are time-barred. There may well be a sunny side up in the chicken company’s quest for justice. We look forward to the final resolution of this stew, the chicken scratch of a judge’s signature that will put a final number on the liability of an insurance operation that flaps my wattles (ie., annoys me). Here’s a little unsolicited advice to Murray Bresky Consultants: don’t count your chickens before they hatch. This one has a long way to go before the company can feather its nest with the proceeds of a complex litigation. In the meantime, their free range chickens have the run of the coop, enjoying their cage-free, stress-free lives right up to the very end. Bon appetite! Health Wonkery – At Wright on Health, Brad Wright has posted the Sardonic Edition of Health Wonk Review. He takes a bit of a tongue in cheek approach to the seriousness of our usual wonkery. Harumph, harumph. Check it out. The future of manufacturing – Joe Paduda posts Where’s manufacturing going – and why should you care? He says you should care because “manufacturing jobs drive workers comp premium.” He reports on a recent talk at the NCCI Issues Conference which predicted the growth of manufacturing in the US. Related: see our December post: Insourcing: A positive trend for U.S. manufacturing and Joe’s post Manufacturing’s coming back. Different perspectives – At WorkCompEdge Blog, Kory Wells posts Employers and the Work Comp Industry: Failure to Communicate?. She reports on the disconnect between the industry insiders and employers as evidenced in Zywave’s 2013 P&C Workers’ Compensation & Safety Survey with over 3,100 participants. Topics that are heavily covered in workers comp media and widely under discussion by work comp professionals aren’t as high on employers’ radar. Only 28% of employers say they are very or somewhat concerned about opioid issue and only 36% of employers report being very or somewhat concerned about comorbidity issues such as obesity and diabetes complicating recoveries. And although 42% of survey participants were very or somewhat concerned about this year’s change in the experience rating formula, only 15% of employers say they know the value of their company’s loss-free rating, or minimum mod. This raises the issue: are we in the industry communicating enough with employers? Still a problem – While black lung may sound like a disease from a bygone era, that is unfortunately not the case. At Coal Tattoo, Ken Ward Jr. reports that autopsies confirm black lung at Upper Big Branch – it remains a serious concern in today’s coalfields. You know how to make an entrance, what about an EXIT? Dennis Mealy, chief actuary for NCCI, has issued his state of the line report on workers compensation. There’s a lot of good news for insurers, along with a few little red flags that might well morph into big banners of bad news. Mealy’s presentation will soon be available as a webinar at the NCCI site, but for the moment, let’s glean the essence from his Powerpoint presentation. There’s a lot of positive news (with apologies to those who are not up to speed in insurance jargon). Premium is up by $3.3B, about 9 percent in all. The all-important combined ratio has dropped from 115 to 109 (projected). Given suppressed interest rates, 109 is still high, but it puts profitability within reach. The calendar year loss ratio has dropped from the unacceptable – 70.8 percent – to 66 percent. Pre-tax operational gains are plus 5 percent. There is (mostly) good news in the loss area: frequency of lost-time claims is down an average of five per cent across all sectors. Indemnity claim costs are up just slightly, as are severity costs. Even in assigned risk pools – insurers of last resort – results have improved, with combined ratios down to 112 percent, compared to 117 in the two prior years. In all success stories – however modest – there are winners and losers. 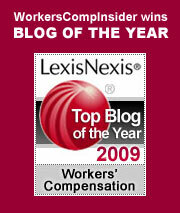 In workers comp, the winners are employers with low losses; the losers tend to be those with relatively high losses. NCCI has upped the ante by changing the way experience mods are calculated. Mealy’s presentation offers a good news/bad news overview of workers comp. On the plus side, we have seen a slight increase in premiums, a reduction in frequency, stable severity and a good capital position for the industry in general. On the negative side, the slow pace of economic recovery is troubling, as is the structural unemployment that threatens the livelihoods of aging, middle class workers. Underwriting is confronted with unprecedented instability in predicting risk: today’s low loss company might well be tomorrow’s catastrophe. Low interest rates impede profitability. Alternative markets – the new opt-out law in Oklahoma being a prime example – threaten to drain good risks from the market and leave higher risks in conventional coverage. Finally, it is too soon to know the impact of health care reform, though in the long run, it seems likely that virtually universal health care should reduce cost-shifting into workers comp. Perhaps we should add the impact of global warming to the negative side. As storms increase in magnitude, the risks to those who are working when storms hit also increase exponentially. As the Chinese curse would have it, we live in “interesting times.” For the moment, from the rather narrow perspective of the workers compensation market, things look cautiously and incrementally better. But as they say in New England, if you don’t like the weather, just wait a minute. It was clear and warm a few moments ago. Suddenly, the wind picks up, the wind chills and the rain comes pouring down. Like a harried underwriter, we struggle to find shelter in the unexpected storm. Our New Zealand blogger pal Russell Hutchinson lends a global perspective to this week’s Cavalcade of Risk #183 – check it out! Austerity’s impact on public health – over at Managed Care Matters, Joe Paduda looks at the impact that financial austerity measures in Greece and Iceland have had on public health, suicide rates, hospital admissions, and other measures of morbidity and mortality. Extraterrestrial workplaces – And from one of the coolest workplaces ever, International Space Station commander Chris Hadfield offers us a musical interlude. Congratulations to Chris & his crew from the on a successful return to earth – but not without first addressing some safety maintenance issues. Joe Paduda has a not-to-be-missed robust edition of Health Wonk Review posted at Managed Care Matters. It covers health care cost trends, reform implementation, motivations and more. Get your biweekly dose of health wonkery from the best in the blogosphere to stay current on the trends. According to Property Casualty360‘s Arthur Postal, workers comp for the deceased first responders and injured city workers will be covered by the state’s Large Loss Fund. The only West Fertilizer employee involved was a first responder killed in the blast who was covered by the fund — the company itself has an “alternative benefit plan” since workers comp is not mandatory in Texas — an issue that raises more questions. See Postal’s related article: The Assault on State-Regulated Workers’ Comp, which talks about Texas, Ohio, New York and Oklahoma. Surgeon-journalist Atul Gawande has a must-read insider’s account in The New Yorker, which explains Why Boston’s Hospitals Were Ready to cope with the emergencies created by the Boston Marathon bombing. While on the topic of excellent medical care, it’s a good time to note that this is National Nurses Week. It runs through May 12, which is the birthday of Florence Nightingale, widely recognized as the founder of modern nursing. One of the key issues facing nursing — and one that has an impact on patient safety, too, is staffing levels. See: Nurses Fighting State By State For Minimum Staffing Laws. Compliance and Safety Blog featured an excellent roundup of links, tributes, historical information, and the 1994 Documentary by Robert Cotter that tells the story of the Hamlet fire in the Imperial Chicken Plant that killed 25 workers, with the story told From The Eyes Of The Survivors. This was an egregious incident – 19 of the deceased workers were mothers with young children. The plant owner locked the emergency exit to prevent theft. While yours truly was off on vacation last week, the risk bloggers weren’t: Here’s last week’s roundup: Cavalcade of Risk #182, posted by Jeff Root of Rootfin, A Texas resident who passed through West, TX within 15 hours of the blast. Hats off to Michael Fitzgibbon, Ontario labor and employment attorney, on his 10 year blogging anniversary at Thoughts from a Management Lawyer – it was a lonely landscape for business bloggers back then, as we well know. He was one of the early links in our sidebar, and is still there today. He names a few other early pioneers in his post. What lies ahead in private disability insurance? In the Insider’s decade of exploring workers comp, we have encountered many unusual instances of compensability, legitimate claim denials and outright fraud. But rarely have we found cases where a claims administrator, in this case, a TPA, simply refuses to pay for medically necessary treatment. The saga of the late Charles Romano reminds us that the great bargain of workers comp is not just between employers and their workers; it includes the good faith effort of claims adjusters to carry out the letter – and spirit – of the law. Charles Romano worked as a stocker for Ralph’s Grocery Company, a California-based operation that is part of the Kroger chain. It is worth noting from the outset that Kroger is self-insured for comp, with Sedgwick serving as the TPA. As a stocker, Romano presumably did a lot of lifting and reaching. He suffered a work related injury involving his shoulder and back in August of 2003. After conservative treatment failed to resolve the problem, he underwent surgery in December 2003. What had seemed like a relatively simple solution to a shoulder problem quickly descended into a grave, life-threatening situation: Romano contracted a MRSA infection following the surgery, which led directly to total paralysis. He suffered renal failure and several heart attacks, which were related to the MRSA infection. After enduring inadequate medical treatment directly related to the TPA’s denial of treatment, Romano died in May 2008. Nearly three years after the initial surgery, a workers comp administrative law judge (WCJ) ordered that the TPA pay for all the medical expenses related to the infection. Without consulting with medical professionals, the TPA unilaterally refused all payments – totalling, by this time, hundreds of thousands of dollars. The TPA appealed the adverse ruling. In February 2012, a workers comp administrative law judge imposed penalties for delay of treatment in eleven specific instances, finding that the TPA “failed in its statutory duty to provide medical care, egregious behavior which increased the suffering of a horrifically ill individual.” He imposed the maximum $10,000 fine for each denial of treatment. The TPA appealed the penalties for delayed treatment. In what surely qualifies as a new definition of chutzpah, the TPA contended that penalties were not appropriate, among other reasons, because the claimant had died. Well, duh, the routine denial of treatment throughout the course of the illness was a significant factor in the death. Romano simply did not receive medically necessary treatments to address his formidable medical conditions. NOTE: The penalties, even when maxed out at $10,000 per incident, is dwarfed by the suffering inflicted upon Romano. The WCJ’s Report makes it clear that he imposed the harshest penalties possible under section 5814 because of defendant’s extensive history of delay in the provision of medical treatment; the effects of those delays on a paralyzed, catastrophically ill employee; the lengths of the various delays; and defendant’s repeated failure to act when the delays were brought to its attention. It is tempting to conclude that the TPA’s actions were related to their customer’s risk assumption – otherwise known as self insurance. It is one thing to purchase insurance (risk transfer) and have the insurance company assume liability for a catastrophic loss. It is quite another for a self-insured company to absorb a loss of this magnitude on its own. (Presumably Kroger had some form of stop loss in place.) Despite the multiple findings of compensability, despite the judicial determination that the horrendous MRSA infection was indeed work related, the TPA persisted in denying treatments and rejecting payments, long after Romano’s untimely death. As Mark Twain famously noted, “denial is not just a river in Egypt.” It’s also a poor strategy for managing claims. In his last years, the unfortunate Charles Romano certainly had to confront health issues beyond anyone’s worst nightmare; denial for him was not an option. For reasons that remain unclear, when it came to paying for Romano’s extensive and expensive care, the TPA chose a path of full catastrophe denial . In the findings of the court, this denial was in itself an unmitigated disaster for the acutely vulnerable Romano, accelerating his precipitous decline and death. In the interests of saving their client some serious bucks, the TPA dug in its heels and refused to accept the compensability of a claim that had been adjudicated as compensable. In doing so, they violated the spirit and letter of the workers comp contract and earned themselves, in this particular instance at least, a place on the Insider’s Management Wall of Shame.